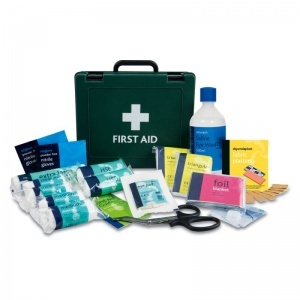 Heavy Good Vehicles (HGV) are required by law to carry a first aid kit in case of emergencies. The Basic HSE HGV First Aid Kit provides drivers with everything they need in the event of a roadside accident or injury. The transport industry have slightly different needs, as a lot of the employees will be working away from their base, so will need easily accessible first aid provisions on hand. All contents in the HGV kit meet the PSV regulations of 1981, ensuring that employees are safe wherever they travel. What Can You Expect to Find in the HGV Kit? The kit comes in a clearly marked green Oxford box, robustly designed to endure any bumps and knocks during transit. All of the materials provided have been approved by the Health and Safety Executive and have been made with the first aid novice in mind. The Basic HSE HGV First Aid Kit is usually dispatched via First Class Royal Mail and delivery should be within 1 to 3 working days.